Significant improvement in adherence to a clear separation of concerns. Clearly delineated architectural layers and services provided as interfaces. Simple and default implementations that allow for quick adoption and ease of use out-of-the-box. The following diagram is a simplified version of the batch reference architecture that has been used for decades. It provides an overview of the components that make up the domain language of batch processing. This architecture framework is a blueprint that has been proven through decades of implementations on the last several generations of platforms (COBOL/Mainframe, C/Unix, and now Java/anywhere). JCL and COBOL developers are likely to be as comfortable with the concepts as C, C#, and Java developers. Spring Batch provides a physical implementation of the layers, components, and technical services commonly found in the robust, maintainable systems that are used to address the creation of simple to complex batch applications, with the infrastructure and extensions to address very complex processing needs. The preceding diagram highlights the key concepts that make up the domain language of Spring Batch. A Job has one to many steps, each of which has exactly one ItemReader, one ItemProcessor, and one ItemWriter. A job needs to be launched (with JobLauncher), and metadata about the currently running process needs to be stored (in JobRepository). The simple name of the job. Definition and ordering of Step instances. Whether or not the job is restartable. A JobInstance refers to the concept of a logical job run. 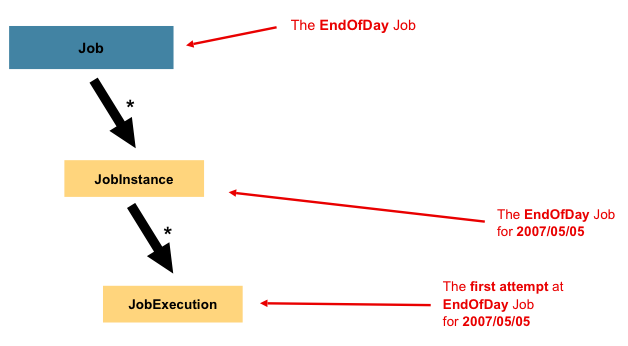 Consider a batch job that should be run once at the end of the day, such as the 'EndOfDay' Job from the preceding diagram. There is one 'EndOfDay' job, but each individual run of the Job must be tracked separately. In the case of this job, there is one logical JobInstance per day. For example, there is a January 1st run, a January 2nd run, and so on. If the January 1st run fails the first time and is run again the next day, it is still the January 1st run. (Usually, this corresponds with the data it is processing as well, meaning the January 1st run processes data for January 1st). Therefore, each JobInstance can have multiple executions (JobExecution is discussed in more detail later in this chapter), and only one JobInstance corresponding to a particular Job and identifying JobParameters can run at a given time. The definition of a JobInstance has absolutely no bearing on the data the to be loaded. It is entirely up to the ItemReader implementation to determine how data is loaded. For example, in the EndOfDay scenario, there may be a column on the data that indicates the 'effective date' or 'schedule date' to which the data belongs. So, the January 1st run would load only data from the 1st, and the January 2nd run would use only data from the 2nd. Because this determination is likely to be a business decision, it is left up to the ItemReader to decide. However, using the same JobInstance determines whether or not the 'state' (that is, the ExecutionContext, which is discussed later in this chapter) from previous executions is used. Using a new JobInstance means 'start from the beginning', and using an existing instance generally means 'start from where you left off'. In the preceding example, where there are two instances, one for January 1st, and another for January 2nd, there is really only one Job, but it has two JobParameter objects: one that was started with a job parameter of 01-01-2017 and another that was started with a parameter of 01-02-2017. Thus, the contract can be defined as: JobInstance = Job + identifying JobParameters. This allows a developer to effectively control how a JobInstance is defined, since they control what parameters are passed in. Not all job parameters are required to contribute to the identification of a JobInstance. By default, they do so. However, the framework also allows the submission of a Job with parameters that do not contribute to the identity of a JobInstance. A JobExecution refers to the technical concept of a single attempt to run a Job. An execution may end in failure or success, but the JobInstance corresponding to a given execution is not considered to be complete unless the execution completes successfully. Using the EndOfDay Job described previously as an example, consider a JobInstance for 01-01-2017 that failed the first time it was run. If it is run again with the same identifying job parameters as the first run (01-01-2017), a new JobExecution is created. However, there is still only one JobInstance. A java.util.Date representing the current system time when the execution was started. This field is empty if the job has yet to start. A java.util.Date representing the current system time when the execution finished, regardless of whether or not it was successful. The field is empty if the job has yet to finish. The ExitStatus, indicating the result of the run. It is most important, because it contains an exit code that is returned to the caller. See chapter 5 for more details. The field is empty if the job has yet to finish. A java.util.Date representing the current system time when the JobExecution was first persisted. The job may not have been started yet (and thus has no start time), but it always has a createTime, which is required by the framework for managing job level ExecutionContexts. A java.util.Date representing the last time a JobExecution was persisted. This field is empty if the job has yet to start. The "property bag" containing any user data that needs to be persisted between executions. The list of exceptions encountered during the execution of a Job. These can be useful if more than one exception is encountered during the failure of a Job. Column names may have been abbreviated or removed for the sake of clarity and formatting. A StepExecution represents a single attempt to execute a Step. 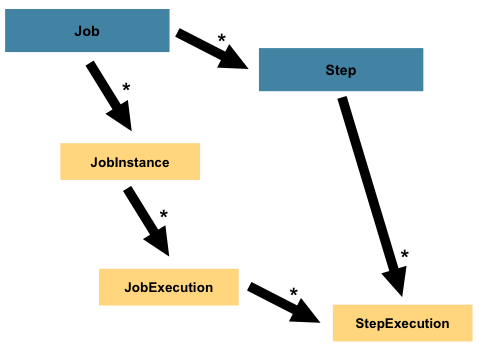 A new StepExecution is created each time a Step is run, similar to JobExecution. However, if a step fails to execute because the step before it fails, no execution is persisted for it. A StepExecution is created only when its Step is actually started. A BatchStatus object that indicates the status of the execution. While running, the status is BatchStatus.STARTED. If it fails, the status is BatchStatus.FAILED. If it finishes successfully, the status is BatchStatus.COMPLETED. A java.util.Date representing the current system time when the execution was started. This field is empty if the step has yet to start. A java.util.Date representing the current system time when the execution finished, regardless of whether or not it was successful. This field is empty if the step has yet to exit. The ExitStatus indicating the result of the execution. It is most important, because it contains an exit code that is returned to the caller. See chapter 5 for more details. This field is empty if the job has yet to exit. The number of items that have been successfully read. The number of items that have been successfully written. The number of transactions that have been committed for this execution. The number of times the business transaction controlled by the Step has been rolled back. The number of times read has failed, resulting in a skipped item. The number of times process has failed, resulting in a skipped item. The number of items that have been 'filtered' by the ItemProcessor. The number of times write has failed, resulting in a skipped item. In this case, after the above code runs, the current line is 40,322, allowing the Step to start again from where it left off. The ExecutionContext can also be used for statistics that need to be persisted about the run itself. For example, if a flat file contains orders for processing that exist across multiple lines, it may be necessary to store how many orders have been processed (which is much different from the number of lines read), so that an email can be sent at the end of the Step with the total number of orders processed in the body. The framework handles storing this for the developer, in order to correctly scope it with an individual JobInstance. It can be very difficult to know whether an existing ExecutionContext should be used or not. 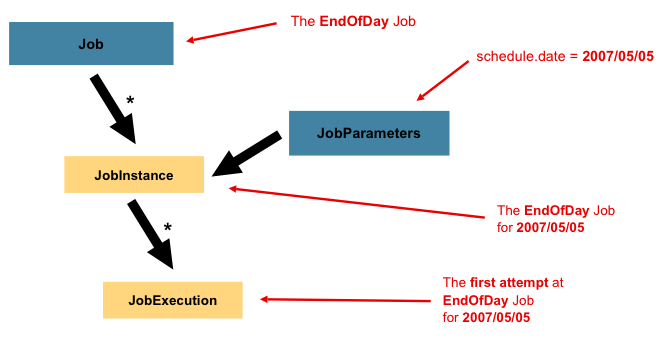 For example, using the 'EndOfDay' example from above, when the 01-01 run starts again for the second time, the framework recognizes that it is the same JobInstance and on an individual Step basis, pulls the ExecutionContext out of the database, and hands it (as part of the StepExecution) to the Step itself. Conversely, for the 01-02 run, the framework recognizes that it is a different instance, so an empty context must be handed to the Step. There are many of these types of determinations that the framework makes for the developer, to ensure the state is given to them at the correct time. It is also important to note that exactly one ExecutionContext exists per StepExecution at any given time. Clients of the ExecutionContext should be careful, because this creates a shared keyspace. As a result, care should be taken when putting values in to ensure no data is overwritten. However, the Step stores absolutely no data in the context, so there is no way to adversely affect the framework. As noted in the comment, ecStep does not equal ecJob. They are two different ExecutionContexts. The one scoped to the Step is saved at every commit point in the Step, whereas the one scoped to the Job is saved in between every Step execution. JobRepository is the persistence mechanism for all of the Stereotypes mentioned above. It provides CRUD operations for JobLauncher, Job, and Step implementations. When a Job is first launched, a JobExecution is obtained from the repository, and, during the course of execution, StepExecution and JobExecution implementations are persisted by passing them to the repository. When using java configuration, @EnableBatchProcessing annotation provides a JobRepository as one of the components automatically configured out of the box. It is expected that implementations obtain a valid JobExecution from the JobRepository and execute the Job. ItemReader is an abstraction that represents the retrieval of input for a Step, one item at a time. When the ItemReader has exhausted the items it can provide, it indicates this by returning null. More details about the ItemReader interface and its various implementations can be found in Readers And Writers. ItemWriter is an abstraction that represents the output of a Step, one batch or chunk of items at a time. Generally, an ItemWriter has no knowledge of the input it should receive next and knows only the item that was passed in its current invocation. More details about the ItemWriter interface and its various implementations can be found in Readers And Writers. ItemProcessor is an abstraction that represents the business processing of an item. While the ItemReader reads one item, and the ItemWriter writes them, the ItemProcessor provides an access point to transform or apply other business processing. If, while processing the item, it is determined that the item is not valid, returning null indicates that the item should not be written out. More details about the ItemProcessor interface can be found in Readers And Writers. As long as the batch namespace has been declared, any of its elements can be used. More information on configuring a Job can be found in Configuring and Running a Job. More information on configuring a Step can be found in Configuring a Step.